Too much gain can be just as bad, as not enough. With this three band amplifier you have the ability to make your gain adjustments just right. With an adjustable gain control, giving you up	to 25dB of gain in the VHF, 22dB in the UHF and 18dB in the FM Band! This Signature Series 25dB Amplifier is powered by 120 volt mains AC that easily plugs into any standard outlet. All cable connections are the standard F type. This amp also features an on/off light to take the guess	work out of it's current operational status. That's not all, it's tough	on noise and interference because of its heavy metal housing and solid construction. 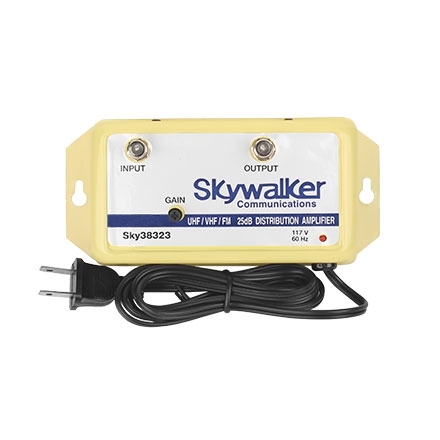 NoteIf you are adding a couple HD Ready TV sets to your TV Antenna Hook-up, this amp will will work fine to offset any loss that is encountered when adding a splitter to feed the additional Outlets. In addition, it comes with an adjustable Gain control, so you can find that sweet spot. Then when you add more loss to the system you have some gain for future additions and a signal Splitter, or balance the amplifier out to feed another amp at the other end of a cable segment to extend your systems reach to another building. It is Forward only (54-1000 MHz), which matches the Bandwidth of any TV Antenna System, however it will not pass any return signals from internet cable modems or Pay Per View Converter Boxes. Check Your Picture quality where the Cable TV feed enters your Home, if it's good there, you can replace connectors, cable and Splitter to bring your installation up to the newest specifications. If you are feeding numerous TV sets or long Distances, use this Amplifier before the Splitter Or long cable run to maintain Signal Quality.